(Phys.org) —A team of entomologists from the University of Illinois has found a possible link between the practice of feeding commercial honeybees high-fructose corn syrup and the collapse of honeybee colonies around the world. The team outlines their research and findings in a paper they've had published in the Proceedings of the National Academy of Sciences. As a managed pollinator, the honey bee Apis mellifera is critical to the American agricultural enterprise. Recent colony losses have thus raised concerns; possible explanations for bee decline include nutritional deficiencies and exposures to pesticides and pathogens. We determined that constituents found in honey, including p-coumaric acid, pinocembrin, and pinobanksin 5-methyl ether, specifically induce detoxification genes. These inducers are primarily found not in nectar but in pollen in the case of p-coumaric acid (a monomer of sporopollenin, the principal constituent of pollen cell walls) and propolis, a resinous material gathered and processed by bees to line wax cells. RNA-seq analysis (massively parallel RNA sequencing) revealed that p-coumaric acid specifically up-regulates all classes of detoxification genes as well as select antimicrobial peptide genes. This up-regulation has functional significance in that that adding p-coumaric acid to a diet of sucrose increases midgut metabolism of coumaphos, a widely used in-hive acaricide, by ∼60%. As a major component of pollen grains, p-coumaric acid is ubiquitous in the natural diet of honey bees and may function as a nutraceutical regulating immune and detoxification processes. The widespread apicultural use of honey substitutes, including high-fructose corn syrup, may thus compromise the ability of honey bees to cope with pesticides and pathogens and contribute to colony losses. "...the researchers have found evidence to suggest the real culprit might be high-fructose corn syrup, which beekeepers have been feeding bees as their natural staple, honey, has been taken away from them." Who needs bees, anyway? It's time for the world to wise up and save itself while we still can. The immune system of bees is compromised but with pollens from GMO plants. I'm pretty sure, this hypothesis will be tested just at the very end for not to threat the Monsanto business. Is there any data about wild colonies and whether or not they are suffering declines at the same rate as domestic bees? Humans need bees for pollination of crops. As a side note, bees don't need humans for anything. I'm going to paraphrase this article as "Junk food is not good for bees either!" If it is HFCS then it is probably the toxic mold residues in the HFCS. HFCS is NOT made using inorganic chemicals per se, but by using enzymes produced by Aspergillus Niger a mold. The molds are manipulated into producing mass quantities of the enzymes that are then purified and used to break down Corn starch. That molds can LEAVE toxic residues is well known. IT doesn't seem like anyone has bothered to see if that's happening in HFSC production. Evidence indicates TRUE A. niger strains do produce ochratoxin A and the isoflavone orobol. The Wikipedia has a great article on ochratoxin A. It's effect on biological systems make it the likely culprit. Such mold residue in the HFCS should be the target, not HFCS itself, since fructose and glucose are basic bee food found in flowers. The weird thing for the bees is the source of the HFCS one is produced using mold another is produced by plants to entice bees to pollinate. That's the exactly the point: the bumble bees are on decline too. Including the bats, which are consuming pollens too. Both syndromes started in the USA, which is experimenting with GMO for longest time. Sounds like Monsanto either owns or bought the "research" team again. Sounds like something they would orchestrate since the "March against Monsanto worldwide" begins in every major city on May 25,2013. Its a no brainer really. If corn syurp were what honey bees need to survive then they would be making corn syurp and not honey. Actually the corn sirup helps to survive the bee keepers, not bees. It's sorta cheating of customers, because the honey from artificial corn syrup lacks the valuable nutrients from real nectar. The beekeepers just didn't realize, that the sirup from GMO corn contains the same pesticides, which are killing corn pests and which the GMO corn was developed for. Still all speculation! Although I wouldn't doubt that HFCS is a problem when it has been shown that HFCS causes receptors for satiety in human brains to turn off, leading to the current obesity epidemic. We didn't have the high percentage of obesity when cane sugar was the main sweetening ingredient. I have never and will never feed my bees HFCS. EFF'ing HFCS! There is NOTHING good from that crap and we need to stop using it for anything. But.. but .. it's soo cheap. And the free market society loves the cheap things (particularly when the producer can dissolve the hidden cost of product in another areas of economy, like the health care organized/financed with government from mandatory fees). Whole the free market economy is based on the less or better masked cheating of one group of people with another, usually smaller one. All corn in the U.S. mainland is GMO because it cross pollinates by wind. It is also not cheap to produce corn syrup or ethanol as this industry is subsidized. There is something wrong with the corn. I'm surprised the researchers haven't looked at the high levels of mercury found in HFCS. Renee Dufault found levels of up to 0.570 micrograms Hg per gram. As the average HFCS intake in the US is 50 g per day, a 70 kg adult would have an intake of Hg of up to 28 mcg per day, or 4 times the EPA recommended intake for methylmercury. 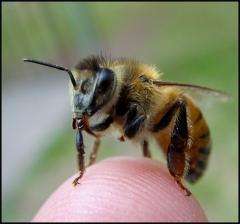 A bee would receive a massive dose relative to its body weight. Mercury from chlor-alkali plants: measured concentrations in food product sugar. Guess they never heard of the experiments that fed white bread to rats. Why would they think that feeding bees sugar would provide all their nutritional needs? If you put a wireless phone next to a Bee Hive ALL the bees leave. That's because they were called inviting them to a party! That's what's has been heard quite often here in my country, Holland. GM crops are not allowed in the EU space and it's organic bee holders (among others) who are complaining. AFAIK even wild colonies seem to be affected. I'm just learning to be a bee keeper and find this whole subject fascination. my teacher/mentor is a 5th generation bee keeper and predicted that CCD had something to do with feeding sugar. many beekeepers here had 50 -75% losses this spring (of the experienced guys) and many are blaming pesticides and that I suppose is probably part of it by my teacher didn't loose any more than usual 5 - 10% He never feeds anything except honey and pollen. it's cold here and he generally leaves 70-80 lbs of honey on the hives for winter.